In 2009, now-Gov. Bob McDonnell (R) won the Virginia gubernatorial election in a 17-percentage point rout. Three years later, President Barack Obama (D) won Virginia by almost four percentage points en route to reelection. The obvious story centered around differences in turnout: In 2009, just 40.4% of registered voters turned out to vote, and that year's exit poll found 1 that 78% of voters were white. Just 16% were African American, and Latino and Asian-American voters made up just 5% of the vote. As for party ID, the electorate was 37% Republican and 33% Democratic. In 2012, 71.8% of registered voters showed up at the polls, and the exit poll showed that 70% of voters were white, 20% were African American, 5% were Latino and 3% were Asian American. The electorate was 39% Democratic versus just 32% Republican. Clearly, the make-ups of the 2009 and 2012 electorates were very different. Yet above the demographics, most Virginia localities* actually contributed nearly the same share of the vote in both the 2009 and 2012 elections. For example, take Virginia Beach, the state's biggest city. In 2009, its voters made up 5.06% of the statewide total; in 2012, they made up 5.10%. That's almost identical in proportional terms, if not in actual raw votes (in 2009, Virginia Beach cast 100,363 votes; in 2012, 196,641). This relationship was true of almost every place in Virginia. As shown in Figure 1 below, a simple correlation analysis illustrates this point. 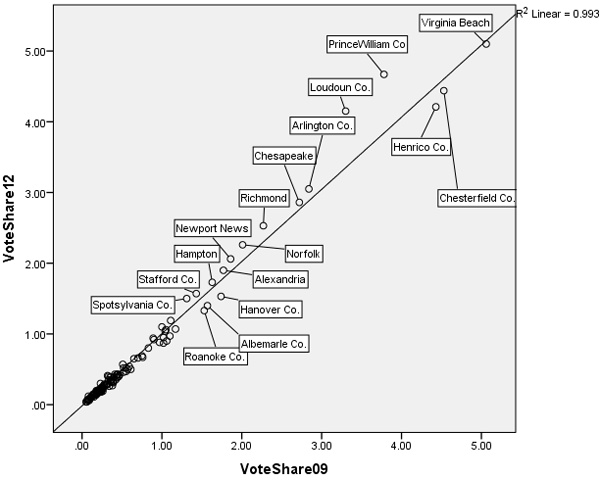 Comparing the 2009 and 2012 share of each Virginia locality, we find that there is a nearly perfect correlation between them: R = .996. This means that a locality's 2009 share of the state's vote usually gave a good indication of what its 2012 portion would be. More than 99% of the variation in the 2012 vote shares can be explained by the 2009 data (R2= .993). Note: Fairfax County (13.77% of the vote in 2009, 13.73% of the vote in 2012) has been visually excluded from the chart in order to better view the data. But its data were included in the actual calculations. But if we examine the graph, there are two localities that stick out for being noticeably distant from the graph's fit line: Prince William and Loudoun counties. Ranking third and fourth in population, respectively, these two large swing counties in northern Virginia have been key places to watch in the last few statewide elections. Their portions of the statewide vote increased the most from 2009 to 2012 in raw percentage terms: Prince William accounted for 0.90 percentage points more of the state's vote in 2012 than 2009, and Loudoun accounted for 0.85 points more. To put that into starker terms, the next largest change occurred in Richmond, which had a 0.26-point growth from 2009 to 2012. Now, this does not sound like much when we talk about percentages, but it actually represents thousands of votes. Everything else being equal, if Prince William's 2012 portion had equaled its 2009 one, its citizens would have cast over 34,000 fewer votes in the presidential election. For Loudoun, the difference would've been close to 33,000 fewer votes. If we look at the actual percentage change in each locality's vote share from 2009 to 2012, Loudoun and Prince William ranked fifth and seventh, respectively. The place that saw the largest shift was actually the small city of Manassas Park, an enclave within Prince William, which had a more than 43% increase in its portion of the state's vote from 2009 to 2012, versus about 26% for Loudoun and 24% for Prince William. But in terms of votes, these major shifts in vote share were most meaningful in the two big swing counties because of their very large suburban and exurban populations. With the drastic difference in the make-up of the 2009 and 2012 electorates, we can guess that many of the voters who voted in 2012 but didn't vote in 2009 were more Democratic-leaning. Besides the obvious indicator of this -- the election result -- we can also see this by comparing the percentage change of a locality's vote share and its raw percentage point increase or decrease in Democratic support. 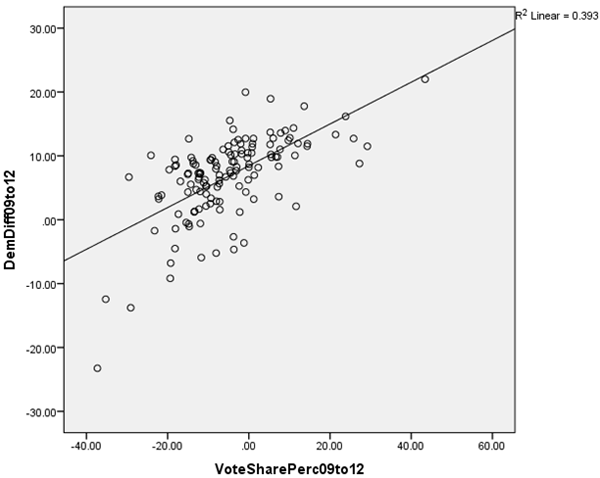 Looking at Figure 2 below, there is a reasonably strong positive correlation (R = .627) between the change in a locality's vote share and the change in a locality's Democratic support level. Thus, while there was not a great deal of change in the vote share of each locality, at least in proportional terms, the make-up of the voters who showed up to the polls changed drastically from the off-off year gubernatorial election of 2009 to the presidential election of 2012. *Throughout this article the term “locality” is used to generally describe Virginia's counties and cities. Virginia has an unusual governance system that has led to it having a large number of “independent cities.” Whereas in most states a city is a part of the county -- e.g. Chicago is part of Cook County -- many Virginia cities are independent of the surrounding counties. For example, the county seat of Albemarle County is Charlottesville, but Charlottesville is an independent city with a separate governing structure from the county. Thus, Albemarle and Charlottesville have separate election results.